After insertion of a 20-French Foley catheter with Tiemann tip, the anterior reconstruction of the bladder neck is performed with two or three interrupted sutures (15-cm Vicryl 3/0, SH needle). Subsequently, the anterior part of the anastomosis is closed over the indwelling catheter. Next, the Santorini vascular complex is reap-proximated to the bladder neck to reduce tension on the anastomosis. 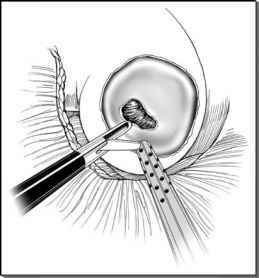 Posterior bladder neck reconstruction is necessary when the orifices are very close (less than 5 mm) to the resection line (i.e., in case of a large midlobe). In critical case, the 20-French bougie with working channel allows to insert of a guide wire (0.038 inch) into the bladder and a central perforated 20-French silicone Foley catheter can be placed safely over the guidewire.